How do I use the RMA feature? The RMA (Return Merchandise Authorization) feature allows you to process returns/exchanges for customers. The RMA can be initiated by the customer, or can be initiated by the merchant at any time after an order has been placed. Use the search bar at the top and search for "Return Merchandize Authorization"
In the Return Merchandise Authorization (RMA) section, check the Enable RMA checkbox. While enabling the RMA module, you will also notice a field labeled "RMA Max Period (days)" below the "Enable RMA" checkbox. This setting allows you to dictate the maximum amount of days allowed (from the date of purchase) before the orders are considered ineligible for an RMA. This setting acts as the global setting of the store affecting all products. As mentioned, the RMA Max Period (days) setting is global to your entire store. However, at the individual product level, you can also specify different RMA periods for specific products using the product's "Advanced" tab. This alternate setting can be useful if you want your store to have a return policy of 30-days for the majority of products while certain, higher-end items are limited to 15-day returns. To do this, you would simply navigate to the individual products and go into its "Advanced" tab to set it with a shorter RMA max period. Once you have enabled the RMA module, you will need to configure your RMA settings. The RMA settings allow you to specify the selectable choices (Methods) your shoppers will have for the return. For example, options like money back, exchange for the same product, or exchange for a different product. You can also set the selectable choices for the reasons why a customer would be returning a product. These options can be things like the order item being broken, the product is disliked, or the product is not what they expected. Click on the Change RMA Settings link in the Return Merchandise Authorization (RMA) section. Edit the choices for method of return in the Method column. If there is a default method input that you do not want to offer, you can uncheck the "Visible" checkbox to make it not appear. You can edit these as needed or even add your own using the custom methods listed. Click Save at the top right to set the changes. Edit the choices of reasons for the return in the Reason column. If there is a default reason input you do not want to offer, you can uncheck the "Visible" checkbox to make it not appear. You can edit these as needed or even add your own using the custom reasons listed. Your shoppers has received their order and requests to return it. As merchant, you are requesting that the items be returned for merchant specific reasons. We'll discuss both types here. After an order has been placed, the shopper can login into their customer record/account and initiate a RMA at any time. Once the RMA had been sent in, you (as the merchant), will be sent an email notification. Finally, the customer can add comments in the Comments section. This is optional on their part, but these comments will be visible to you (the Merchant). Once done, they will click Save RMA and en email will be sent to both you and the customer. After initiating the RMA, your customer will receive an automated email advising them that the RMA was received. the message will contain the order number, the RMA number and instructions to await a response from your team before shipping the product back. The actual contents of this automated email can be edited by going to the Settings ->Design ->Emails section of your Online Store Manager and editing the template labeled "RMA - New RMA - Customer." As merchant, you will also get an automated email stating that the RMA has been left. This email will list basic RMA information such as the order number, the RMA number and the customer's name. Similarly, the contents of this email can be edited as well in the same section mentioned above. The template is labeled "RMA - New RMA - Merchant." After the order is placed, you (as merchant) can also initiate the RMA. 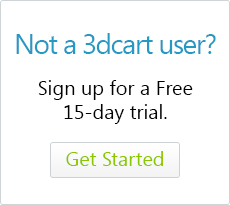 This process will be started in the Actions button while viewing the order in your 3dcart Online Store Manager. Once initiated, the RMA will be visible to your shopper via their "My Account" pages on the store. While viewing the order, click on the "Actions" button located at the top right. Include a staff response (viewable to the customer) and Internal comments (visible only to your staff) on the RMA. Unlike the customer initiated RMA, a merchant initiated RMA will not automatically email your shopper that the RMA has been created for them. For Merchant initiated RMAs you will want to proactively reach out to the customer and let them know that the RMA was created. Your store's CRM feature would be a great way to send this RMA notification email! After the RMA has been created, you can begin processing the request. 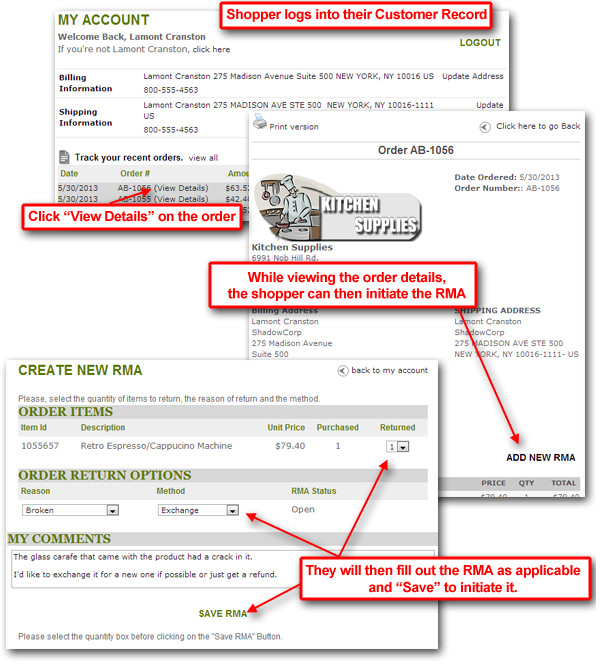 View the RMA, if it looks acceptable, you can then click on the "Send the RMA instructions Email" button . The RMA instructions email is a basic template that includes basic instructions for your shopper when they return the item. The default template for the RMA instructions is in the Settings ->Design ->Emails section and it is titled "RMA - RMA Authorization Instructions." This email can be modified to say whatever you need. You can choose to send an additional message to the customer in the Staff Response section. This will display to the customer when they login to their account on your website in the RMA. You can also write an internal message in the Internal Message section. This will not display to the customer. Move the RMA Status to Processing and click "Save RMA" set your changes. The RMA will remain in "Processing" while you await the return of the item(s). Once you receive the returned product, you can finalize the RMA. In the Order Items section, select the number of returned items you have received in the Qty. Received dropdown. If these items are to be re-applied to your inventory, select the amount of items you will be restocking in the Qty. Restock dropdown. Reapplying the inventory automatically updates your store's inventory of the item. Write any comments to the customer in the Staff Comments section. Move the RMA Status to closed in the "Order Return Options" section. Once you close the RMA it cannot be reopened or modified again. Click "Save RMA" to complete its status change. Any refunds will need to be done manually through your payment gateway/merchant account. 3dcart's RMA process only documents the return for tracking purposes but does not tie into the payment gateway in any way. If at any point in the process, if you feel the RMA should be denied or otherwise not honored, set the RMA status to closed and put your comments into the Staff Comments section. This will close out the RMA from any further modifications from the shopper.